How long did it take you to write At Vitoria? Twelve years, from my first tourist visit to the city of Vitoria-Gasteiz in 2006 until the date of publishing in 2018. 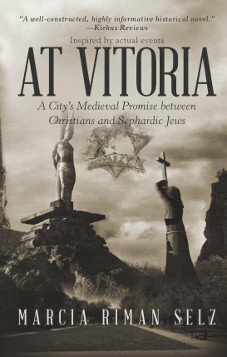 I was intrigued by the story of the cemetery and how the Christians treated the Jews in their city. I began to read books about Medieval Spain, Sephardic Jews, Jewish customs in Spain, the Spanish Inquisition, the importance of a cemetery to a Jewish community and such. In the beginning, I was working and could not devote much time to this project, but when I started to cut back on my work schedule, I was able to devote more of my efforts to researching the book. In the end, I don’t know if At Vitoria is perfect, but writing it was certainly a wonderful experience. What made the story about the cemetery so enticing that you wanted to write this book? I was struck by the dedication that the Jewish physicians showed the Christians of Vitoria during times of extraordinary illness and the respect that the Christians showed the Jewish community in 1492 at the time of the expulsion. This was unique camaraderie. In all the research that I did, I could not find any documentation to counter this belief. Do you have a schedule for writing? Yes. I try to write two hours every day. I follow the approach of novelist Sidney Sheldon. He would spend at least two hours per day writing, usually in the morning. If this schedule was good for Sidney Sheldon, then it’s probably right for me too.